In this article we explore the difference between a pulse, state or event data logger. 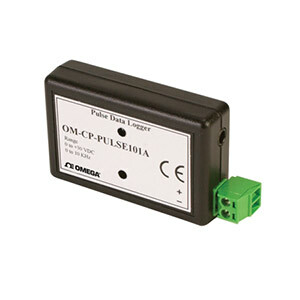 The pulse input data logger OM-CP-PULSE101A is a low-cost recording device that will sense a pulse input or contact closure from external sources such as transducers or pulse initiators (gas, water, and electric meters) and transform those inputs into engineering units. In addition, this data logger allows the user to store user defined units such as gallons/min into the device as well as scale factors and offset values. This enables the user to easily linearize and scale any transducer that provides a pulse or contact closure output to any user required units automatically. Once activated the data logger senses and records the number of pulses/contact closures that occur within adjacent “time bin” periods. The bin period is selectable from 1 second to over 24 hours. At the end of each bin period, the total number of pulses/counts within the bin period is recorded. The data logger then starts another bin period and continues until either the memory is full or the test period has ended. Its real time clock ensures that all data is time and date stamped. This is ideal for recording events. The storage medium is non-volatile solid state memory, providing maximum data security even if the battery becomes discharged. Its small size allows it to fit almost anywhere. Data retrieval is simple. Plug it into an empty COM port and our easy-to-use software does the rest. The software converts your PC into a real time strip chart recorder. Data can be printed in graphical or tabular format and can be exported to a text or Microsoft Excel file. Password Protection: An optional password may be programmed into the device to restrict access to configuration options. Data may be read out without the password. Engineering Units: Native measurement units can be scaled to display measurement units of another type. This is useful when monitoring outputs from different types of sensors such as flow rate, wind speed and more. Note: Comes complete with 3.6V lithium battery. Operator’s manual and USB interface cable are included with the OM-CP-IFC200 Windows software (required to operate the data logger, sold separately).